Now lets have a look at the Automower 315 from Husqvarna. They have been in the business of building robotic lawn mowers for over two decades and have learned from the early days which as resulted in a brilliant range for 2019. The Husqvarna Automower 315 is a fantastic robot mower designed for medium to large lawns of up to 1,500 square metres. It can cope with some pretty steep slopes compared to its competitors of up to 40% to make sure it deals with all those awkward lawn areas easily. It has many features associated with the very high end robotic lawn mowers to offer you a superb cut quality to your lawn every day of the year. Never again will you go out to a messy lawn it will always be perfectly cut. If you have a lawn in the region of 1,500 square metres in size you will know that it requires a lot of work to keep it good condition and often large areas do not get cut as often as you would like. The Automower 315 will cut all of your lawn so that you can relax and enjoy the garden not spend hours getting into a decent condition. Scheduling your cuts is easy and can be done remotely, you can have your lawn cut every day if you like! A massive time saver that will add so much to your garden. In the UK we get sporadic sunny days so make sure your lawn is ready to enjoy those days in the garden and you don’t end up spending them working hard in the sun pushing a heavy mower around. There are so many pros to this model and the concept of robot mowers, below are a few related to this model. Automatic cut scheduling based on lawn growth rate. Can cop with steep slopes up to 40%. Super quiet and can cut while you sleep. We can’t find many cons but there are a couple depending on your garden set up. Initial set up can take a while depending on your garden. Can’t go up or down stairs or ledges. Expensive compared to a push mower. If you value your time and want to spend as much time as possible relaxing in the garden with your family then this is money very well spent and will change the way you look at gardening. If you are paying a gardener to maintain the lawn you will recoup your money against his fees over time so again, a good purchase. There is no doubt that the initial outlay is large but we think it is well worth it. Safety is an important aspect with the robot mowers especially if you have children and animals running around the garden when it could potentially be working. The Automower 315 takes care of safety well. The scheduling allows you to set the mower to cut the lawn when it is least likely anyone will be in the garden, even cutting it over night or early in the morning. There are lift and tilt sensors which immediately stop the blades if the mower is lifted up or tilts over too far and there is also a PIN lock so that anyone without the PIN cannot operate the mower it will only perform its scheduled cuts. Setting up the Automower 315 is a breeze. In the box you will find boundary wire and pegs to map out your lawn. This will take an a couple of hours depending on how complicated the shape of your lawn is, all you need to do is peg the boundary wire down around the edge of the lawn and connect it up to the charge station and you are away. Its always a good idea to cut the lawn to reasonable height before it starts as well. All in all set is easy and once it is done you can sit back and let the robot take care of the cutting all years round. Now lets have a look at the features offered with this model. It has tons of great features that will keep your lawn looking beautiful. If you think this could be for you then click through to Amazon to view the prices. The smart mowing capability on the model will self schedule cuts based on the growth rate of your lawn! A brilliant feature that will control the amount of cuts through the seasons as you won’t need as many cuts in the spring as you will in mid summer. The built in sensors will work out the growth rate between cuts determining when is the optimum time to cut again! The 315 is powered by a very efficient and powerful electric motor and a rechargeable lithium battery. They power the wheels and three blades to give you a brilliant cut. The unit weighs in at 8kg so it doesn’t take a lot of energy to keep this moving around. It will cut for just over an hour before it takes itself back to the charge station for a re charge before coming back out if it needs to. The Automower 315 is well protected from the elements. All of the working parts are sealed in the unit so it will not be damaged by rain or wet grass. When the weather gets too bad it will take itself back to the charge point. As well as being weather proof the 315 is able to sense when it is raining and stop cutting the lawn until it stops or not start the cut in rainy conditions. It’s important not to cut in the rain for the best finish to your lawn. But don’t worry if it gets caught in the rain it will head back to the charge station causing no damage to the mower or lawn and come out to finish the job when the rain has stopped. You can connect to the Automower 315 from your smart phone which will enable you to set the schedule or start add hoc cuts when needed. Very handy if you are not around the house a lot and need to change the schedule. Definitely a feature for very busy lives and the techies among us. The two large back wheels and two smaller front wheels allow the Automower 315 to get great traction when tackling steep slopes and bumps in the lawn that will bring some of the cheaper models to a halt. The ability to cut a slope that is up to 40% in steepness puts this robot mower in a different league to many and suits a lot of awkward lawns. The four wheels give it ultimate manoeuvrability in tight corners as well. No more chugging away of a petrol mower in the garden while you are trying to relax with a cup of tea. This model is not silent but it is quiet enough to cut the lawn while you sleep kicking out less than 60 decibels in noise. A brilliant robot mower from Husqvarna that offers many features over and above the generally great concept of robot mowers. The ability to cope with steep slopes and the intuitive self scheduling of cuts based on growth rate is brilliant which means almost no human intervention. Set up is easy and once it is done you can sit back and enjoy the garden not look out of the window knowing that you have hours of work to do to get it looking great. For family life it is a really brilliant tool making the garden usable on any day of the year and taking some of the burden away from a busy lifestyle. The Husqvarna build quality and service is second to none and this will serve you well for many years. 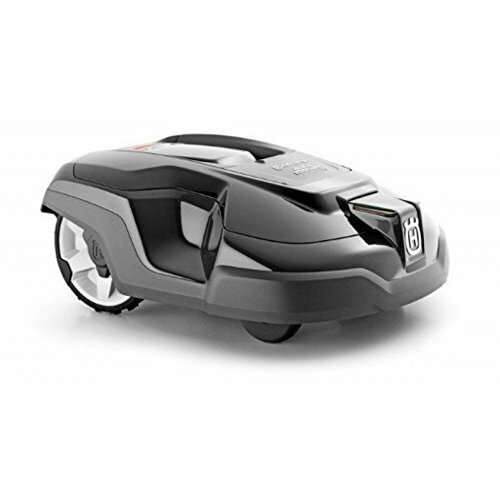 We highly recommend the Husqvarna Automower 315 to anyone with a lawn of up to 1,500 square metres.